Brief Synopsis – A young financial entrepreneur joins a stock brokerage firm in order to show his father that he can be a legitimate success but then finds out that not everything is as it seems. My Take on it – This is a film that I recall seeing on DVD when a friend suggested that we watch it due to his love for the stock market. I haven’t seen it in a very long time, so when I saw that Damien of The Damien Riley Podcast choose it as his suggestion for January’s Movie of the Month on The LAMB., I decided to give it another whirl. 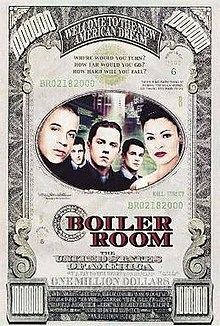 This is a film that came at the the perfect time because the early part of the 21st Century was the time when everyone looked at the world of finance in a very different way than they would just a few short years later. The cats in this film is superbly chosen and it helped strengthen the budding carers of Vin Diesel, Giovanni Ribisi, Nia Long and Nicky Kaat. The film is paced really well and that helps keep the viewer in the mood for this kind of film which is multi-disciplinary when it comes to trying to pin an exact genre on it since it uses elements of various ones throughout. The financial terminology used is minimal and whenever they need to, they explain things in a succinct way for those of us unfamiliar with the financial world. This helps things go as smoothly as possibly as the film moves along to a thrilling end. Bottom Line – Great idea that came out at the right time to be highly successful. The cast is superb and helped strengthen the careers of Diesel, Ribisi, Long and Kaat. The pacing is super fast and that helps get the viewer in the mood for the kind of story being told which is a mixture of numerous genres. The financial terminology is kept to the minimum and they do their best to explain things as well as possible so that things move smoothly throughout. Recommended!